It's been a long time coming, but they are finally here! 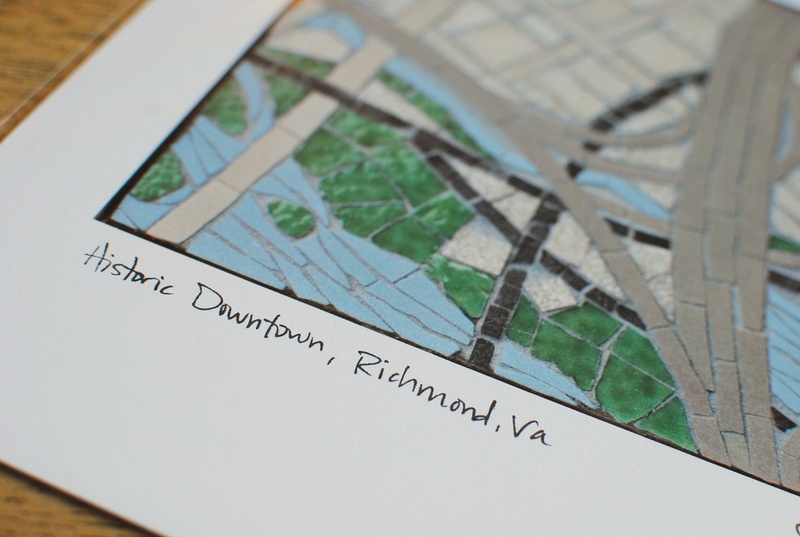 Last summer Johannah created a series of mosaic maps based on images of the Richmond, VA area. We wanted to have them made into art prints, but this was something entirely new to us. So we took our time and did our research, and we couldn't be happier with the results! The series includes three images: "Now Entering Richmond," "James River in Richmond," and "Historic Downtown." Each one zooms in a little closer on the city of Richmond, the James River, and the roadways and built environment of the city. The 8"x10" matte prints were created locally from high resolution digital images of the original mosaic maps on 100 lb. paper. Huge thanks to Uptown Color for guiding us through the process! The prints are available individually and as a set in our Etsy shop, and of course we'll have them with us at craft fairs! Two of the three originals are also available. Speaking of craft fairs, we've added a last minute addition to our spring show schedule this weekend. Come on out and see the prints in person on opening day for The Carytown Market! This Sunday, May 3 from 11 to 3 in the Wells Fargo parking lot at 3201 W. Cary St. Find something great for your mom in Carytown (maybe a Richmond map print?? ), plus great food from small scale local producers, local bands, and us, your local artisans, in the new Artisan Booth. Johannah took a short creativity break from the production work of coat racks and pendants to create a series of images of our home base, Richmond, VA. I've always loved maps. As a kid, I covered the walls of my room with poster-sized National Geographic maps. Today I love to discover hidden spots on maps to explore in real life, and track long trips with our kids. Maps offer a wide variety of information, and sometimes, a new way to look at the world around us. Here are a few shots of the process so far in creating my new series of maps. 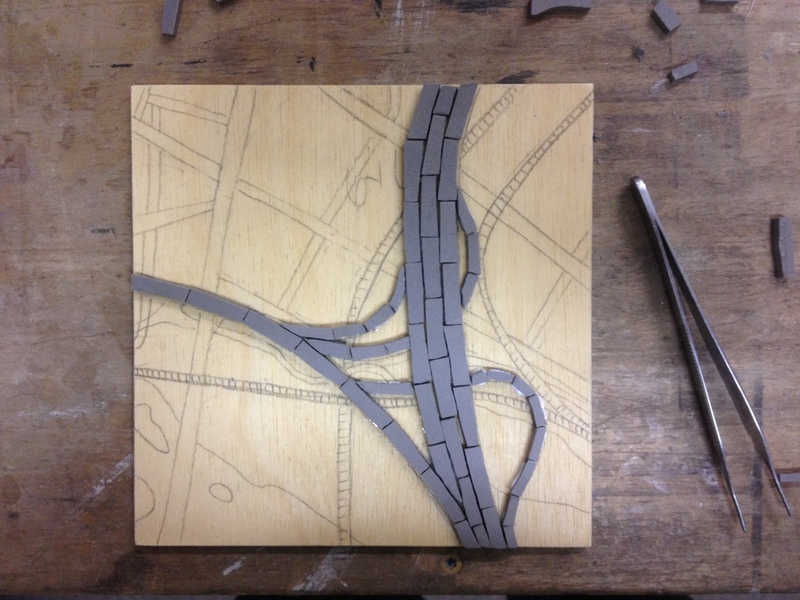 The first piece in the series is a roadmap of the metropolitan Richmond region. I wanted to create a look somewhere between the Google map we know today, and a classic road map. The four tiles on the right are background color options. The top three are glass. I ended up going with the unglazed porcelain at the bottom. The second piece moves in a bit on the city of Richmond, focussing on the river and human development of the area. This image is based on a satellite image of the region. The river, downtown islands, and densest areas of development are completed here. The third and final piece is an aerial view of the heart of downtown Richmond. This is a map of historic transportation routes in the city: interstate (completed here), railroad, street roads, and water. The completed series (and my trusty tea mug) awaiting grout and frames.